No randomized trial has been reported comparing different chemotherapy regimens on disseminated nasopharyngeal carcinoma (NPC). This study aims to compare five cisplatin-based regimens including cisplatin + 5-fluororacil (PF), paclitaxel + cisplatin (TP), gemcitabine + cisplain (GP), paclitaxel + cisplatin + 5-fluororacil (TPF), and bleomycin + cisplatin + 5-fluororacil (BPF) regimen most frequently used as the first-line protocols for metastatic NPC retrospectively. Eight hundred and twenty-two patients with metastatic NPC were divided into five groups according to the regimen they received. Then, their response rate, toxicity, and long-term survival outcome as well as the prognostic factors were analyzed. The higher response rates in GP and TPF regimens comparing to PF regimen were achieved (Χ 2 = 4.57, P = 0.033; Χ 2 = 7.04, P = 0.008), as well as in TPF regimen comparing to TP regimen (Χ 2 = 5.579, P = 0.018). The occurrence rate of the major III–IV grade toxicity was significantly different between the five groups. However, no statistically significant difference was observed in progression-free survival (PFS; P = 0.247) and overall survival (P = 0.127) among the five groups. Cox multivariate analysis identified the following independent prognostic factors: liver metastases, plasma Epstein Barr Virus (EBV)-DNA level, cycles of chemotherapy, and second-line chemotherapy. 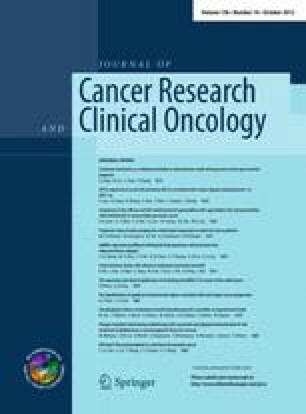 PF, TP, and GP are all effective regimens as the first-line chemotherapy for metastatic NPC, which can be well tolerated. Over four cycles of chemotherapy are recommended under no contraindication. Patients should transfer to the second-line regimen after the treatment failure of the first-line chemotherapy. Xiu-Yu Cai, Ying Jin contributed equally to this work. An erratum to this article is available at http://dx.doi.org/10.1007/s00432-015-1926-1. This work was supported by the National—Eleventh Five Technology Major Project [2008ZX09312-002]; and the Research Award Fund for Outstanding Young Researchers in Sun Yat-sen Cancer Center. Sponsors of the study supported the fees to data collecting and will support the publication of the paper.